Students at the school at which I work learn to decode systematically and explicitly. We believe that, given the balance of evidence, a good grounding in phonics, taught systematically, will provide them with the best opportunity to improve their reading comprehension. A key part of our teaching strategy is using assessment evidence to pinpoint what a student can decode and what they still need to work on. One of the most common questions students, staff and parents have is whether a child is “doing ok” – are they at the standard for their age? 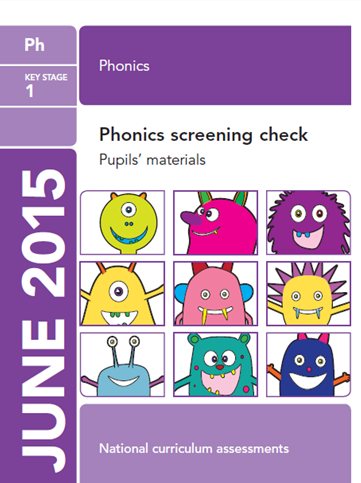 The Phonics Screening Check gives us a standard that we can measure between year levels and across years. We know that students are at standard for their age when they can pass the Phonics Screening Check. It gives a definitive anchor for our work and helps guide what we do. Instead of having an individual feel for what an appropriate level of decoding might be, we have an agreed standard. This aids conversation: we all know exactly what it means to say a student is above or below that standard and we know what instruction and learning is required to get them there. We are able to detect much earlier when a student is in danger of not making the required level and can intervene earlier and with more of a sense of what is required. Another feature of the earlier Screening Checks that is useful is the published item difficulties for each of the words and non-words in the 2012 and 2013 pilots. This gives a good indication of what words or non-words were more difficult than others for the UK students. We can then compare that to how difficult our students found those items and investigate when differences arise. What items are we comparatively strong at? Are there aspects of our instruction around the use of that grapheme that we need to record and make sure we are all include in our practice? There may be other words/non-words our students unexpectedly find difficult to decode. Why can’t our students decode the word? What part of the word is proving to be the stumbling block? What do we currently do to teach the decoding of that grapheme and why is not working? What parts of our instruction need to be revised in order for students to improve? In our school the Prep (5 year old) classes are fluid – the groups are altered every six weeks and teachers change between classes. This results in a shared responsibility for the progress of all students in Prep. Fantastic conversations are had between teachers as they realise that kids who have been in one class are much better at something than students who have been in another class. It might be as simple as noticing children from class A always construct sentences with a capital letter at the start and a full stop at the end, something that doesn’t happen in class B. What is happening in this class that allows students to do this consistently and how can I teach my kids to do the same? Sometimes, though, the differences in student learning between classes are not so obvious and it takes a specific assessment to reveal them. On the UK Phonics Screening Check there are times when students who are notionally in an earlier phase of their phonics work that have greater success in decoding a non-word than a class that should have done better. Why did that happen? What instruction around that grapheme phoneme correspondence in that class was so effective and how is best implemented in the other classes? How can we learn from each other in order to improve the instruction for all students? The sharing of demonstrably effective practice results in teaching that is more successful. It doesn’t necessarily mean that all classes are exactly the same but it does allow the gap in effectiveness of instruction to be decreased. This is an equity issue: a student’s progress should not be based on a lottery depending on whether or not they get an effective teacher when classes are allocated. When the instructional quality of the team is growing, both as a whole and as individuals, all students benefit. The Phonics Screening Check is an important component of the process of instructional improvement and allows a sense of what an appropriate level of decoding looks like. As such, I would heartily recommend it to all schools teaching phonics. IFERI supports and promotes the use of the Phonics Screening Check internationally. It is a free, easy to use, light-touch assessment. For more information, or to download the check, click here. This entry was posted in Assessment, Reading, Systematic Synthetic Phonics and tagged assessment, Australia, blending, decoding, effective reading instruction, nonsense words, phonics, Phonics Screening Check, sharing effective practice, systematic synthetic phonics on 30th July 2015 by Anne Glennie. The PSC has been an enormous boon for our school and our students. One of the things that we value is the presence of a standard. All schools have a concept of what their internal standard (what students should be able to do at particular times in the year) looks like but this sometimes does not reflect the reality of the wider school community. Even when it does, it helps to have a touchstone to realign your internal standards. So, for us, the PSC allows us to check on the progress of our 5 and 6 year olds at three intervals – we assess them at 6 months, 12 months and 18 months of schooling. We match the students against the benchmark, the overall proportion of students who had achieved a particular score and, for the older tests, the percentage correct responses for each of the items on the assessment. This allows us to pick out particular sets of GPCs that we are teaching well or teaching poorly. If a particular word is being done poorly we have a small set of other items to determine which grapheme seems to be the problem, and then we try to refine our instruction to take the best teaching of that particular concept (whether the GPC itself or the blending and segmenting we are doing) and spread it throughout all of our classrooms. I was part of discussions with Jennifer Buckingham about instituting a similar check in Australia – politically it is still sensitive but it would be enormously beneficial for students at our school and others around the country. It is so good to hear of teachers who want to know how well they are teaching and who want to know how well their pupils are doing. Surely that’s how all teachers should view their practice. I am a big synthetic phonics fan. I have been administering the UK screener since late last year and the kids enjoy it. The UK has an agreed on a “pass” score, which I think is 32/40. Currently at my school, we don’t teach complex long digraphs like “igh” until year 2 so the “pass” score might be different from UK. We use the data anyway, to determine what they are competent at and what they need to learn, so it’s still absolutely relevant with or without an agreed “pass” score. Another Q for me is whether the Hammond non-sense words assesment is similar enough to use. This might be more readily accepted since it has been established in oz for so long now. Hi Sarah, thank you for commenting re use of the phonics check in Australia. There are a number of schools in Australia where this decision has already been taken but we have no idea how many or which schools. The use of the check will inform the school, but will not inform the bigger picture of what is happening in schools everywhere regarding effective phonics teaching. That is why it is so important for all schools to use such a check (the same check as one another, in the same timescale – to aim towards as much objectivity as practicable). I’m not familiar with the Hammond check – but I do hope that, ultimately, any phonics check that Australia adopts will be as similar to England’s check as possible to be able to use England’s phonics check, and its year-on-year results as a form of baseline or comparable measure. I do agree that children to stand the best chance of doing well should have been explicitly taught the alphabetic code used in the check as the check is not just about the phonics skills of sounding out and blending an unknown word (be it a ‘real’ word or a ‘nonsense’ word), but about how much ‘code’ the children know well enough. I’d like to recommend to you (if you don’t already do this) that you consider adopting an approach to your phonics provision which I describe as ‘two-pronged systematic and incidental phonics’. This means that not only does the school have a formal, planned order to introduce the letter/s-sound correspondences of the alphabetic code – but also a very active way of introducing any letter/s-sound correspondences that crop up ‘incidentally’ in wider reading and writing and throughout the curriculum. This can be supported by the visual aid of an overview Alphabetic Code Chart. If you have not already visited the site where I provide a wide variety of free Alphabetic Code Charts, you might like to do so because they are very helpful in various contexts. Thus, even though you may not have formally introduced the grapheme ‘igh’ before Year 2, you could have done so through incidental teaching and reference to the chart as words such as ‘night’, ‘light’, ‘fight’, ‘bright’, ‘frightened’ and so on – are very commonly used in our lives. Many teachers use these charts with various phonics programmes. Warmest regards, and thank you again for posting.